Anyone who’s been reading this blog more than a week or two can tell you that I am into making things from book pages (examples: washi tape, tassels, poinsettias, magnetic clothespins). I love books as much as the next person, but I love crafting more and see no harm in repurposing a book that was likely headed for recycling anyway. 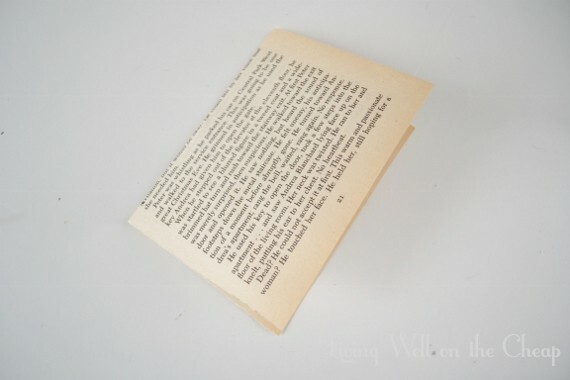 I have a Reader’s Digest condensed book that I got for less than a dollar (at either the thrift store or an estate sale, I can’t be sure) and have used for several projects this year–and there are still hundreds of pages left! 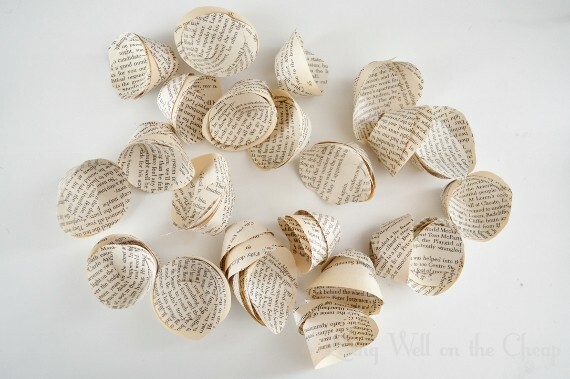 So bibliophiles, avert your eyes, and everyone else behold these simple rolled flowers I made the other day. 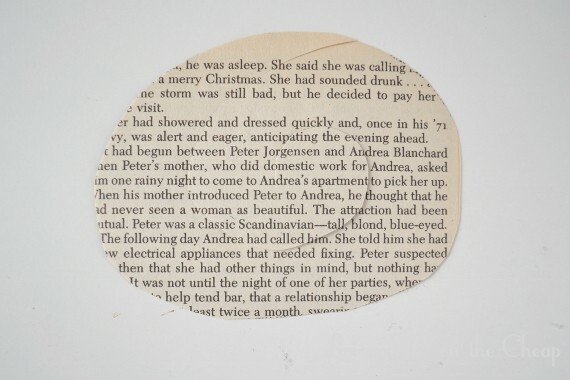 Step one: tear/cut a few pages from your book. Old ones have a nice aged color but fresh white works too if you’ve got an airport paperback taking up room on your shelf. Fold one in half. If you’re making several flowers then go ahead and stack them all up together to save time. 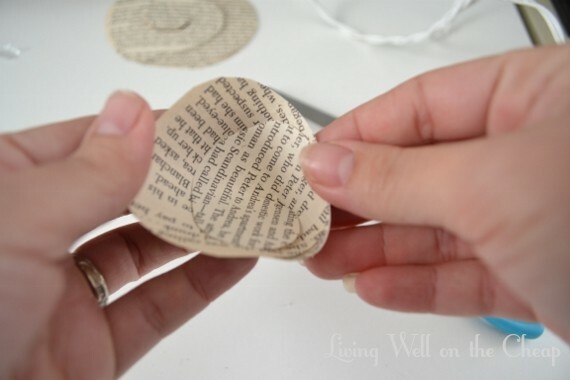 Cut an irregular circle. Perfection is soooooo overrated. Now cut a spiral. Squint and you can see it. Then start rolling it up into itself from the inside. Secure with a few strategic dabs of hot glue. I wish I could tell you exactly where to glue but you just have to play it by ear. One lone flower is not much to write home about, but en masse they’re something special, especially when you see what I did with them (tomorrow!). They remind me of oyster shells in a sort of abstract way. You could scatter them about amongst holiday decor, glue them to a wreath, string them into a garland, or pile them into a clear glass vase. I love the warmth that book pages lend to decor. How’s your week, lovelies? Mine is coming along just swimmingly. 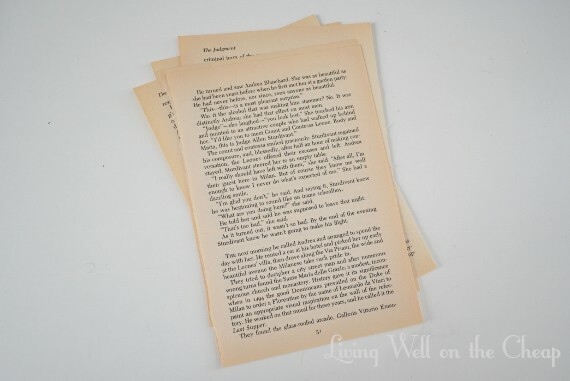 Can’t get enough book page designs! At least you are reusing the same book! I just want you to know that because of you I have been hoarding all sorts of crap that I think I will one day use for a project. How do you know when to save and when to purge? I know you have even less closet space than me, and I don’t have much. Maybe future blog? Hahaha! I have random crap stored in all sorts of nooks and crannies. I have a hard time throwing away something that’s perfectly good and craft supplies are sometimes weird to donate!